Description: Barrie & Jenkins, 1968. First Edition, Hardcover. Good Condition/No Dust Jacket. A good, sound copy, though without its jacket. Previous owner's name to front endpaper, light age tanning to page edges, otherwise clean and unmarked.Anyone interested in ceramics will know that any book by Geoffrey Godden will stimulate, provide abundance of information and will be illustrated with many photographs as he shares his great passion for ceramics. 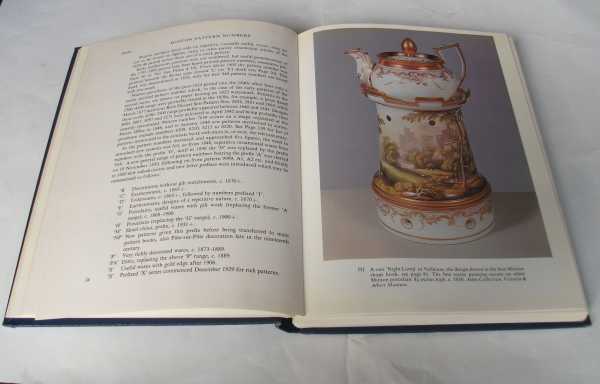 This book is an example of this as he takes us through the period 1793 to 1850 the first years of Minton - the greatest British pottery factory. Lots of additional data on marks, monograms, costs/wages and design descriptions will interest and also aid in identifying old unmarked Minton ceramics. An interesting and useful reference book! (Reader review) 192 pages. Quantity Available: 1. Shipped Weight: Under 1kg. Category: Antiques & Collectibles; ISBN/EAN: 9780257667172. Inventory No: dscf3711.